It's been that kind of two weeks. I lost a beloved cousin, but gained a grandson; and me, I've been having the kind of pain that probably means one of my degenerate vertebrae has crumbled further. I hope there'll be a way to fix that, but at the moment all I've got is the kind of pain medication that turns me into something like a potted plant. With careful timing I get to use my brain long enough to do errands in the morning and to fix dinner in the evening; the rest of the time I just lay around admiring the latest baby photos and languidly waving my fronds. Fortunately the Organizer keeps a steady stream of pictures. 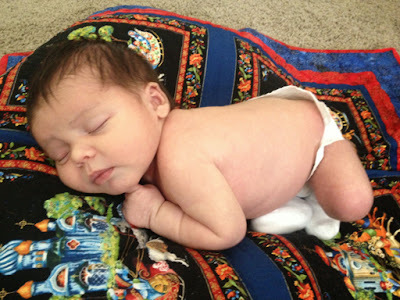 In this one he's scooched up on the little bitty baby quilt I finished just before he was born. The crib quilt...eh, I'm about halfway throughstitching the binding on it. Isn't it strange how even a small quilt turns out to be about six miles around when you get to the binding stage?